I’d just like to thank everyone for their kind words about the prologue last week, I hope you all enjoyed it. This week is Chapter 1 of Crimes Against Magic. For anyone interested in a review copy or interview, please see the details at the end of the post. Be warned – The following contains some scenes of a sexual nature. Saying yes to the job brought a whole new set of problems to deal with. My friend needed me to steal something from a house, despite the fact that he was fully aware of how much I hated breaking into homes. For a start, the occupants were much more likely to call the police and freak out to the media, but mostly I hated them because the variables for a home break-in are astronomical. Anything can go wrong. There are neighbours and pets to consider. Will the inhabitants wake up in the night for a drink? Does one of them work shifts and get home, or get ready for work, just as I’m beginning to do my own? Even after researching the owners, it’s a damn minefield of crap, and I avoided them like the plague. But my client was a good friend, and the pay was excellent. Besides I owed him. And he’s the sort of man who collected on his debts. Jasmine smiled again. It was a beautiful smile, and I regretted that I would never see it again after once the job was over. I glanced past her at a clock hung high on the wall. Almost ten, the party had only been going on for a few hours and it would be a while before it hit full swing. The bedroom was huge, with a four poster bed to one side, an ornate dressing table next to it. Another huge TV hung from the cream coloured wall opposite the bed. Everything was white, cream, or a variation of them. Even the bed’s wood had been dyed cream. It was vaguely disturbing, like the room had been covered in milk. 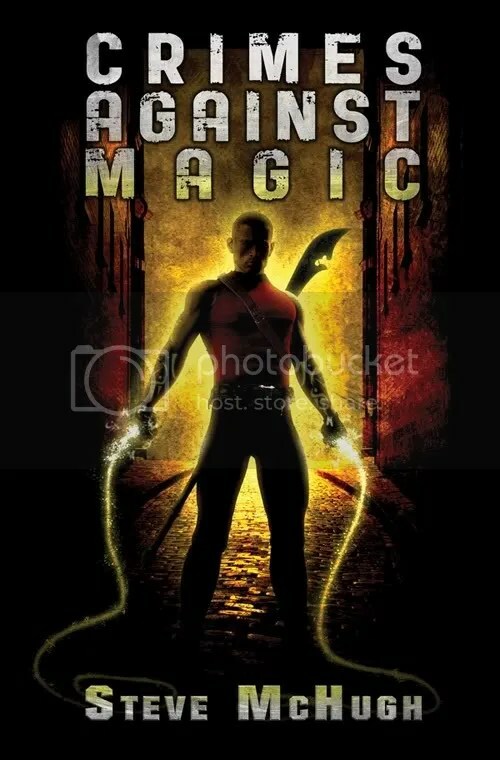 If you’re a book reviewer and are interested in receiving a copy of Crimes Against magic for review, please contact me here with your name and URL of your blog/website. I’m also available for Interviews/Guest Blogs and Giveaways. Thanks! I’m happy to exchange author interviews or blog posts. If anyone is interested in hosting me, then I’ll gladly host you. Please contact me here with your name and URL of your blog/website. Thanks! Posted on April 12, 2012, in Crimes Against Magic, Interview, Writing and tagged CAM, Crimes Against Magic, writing. Bookmark the permalink. 16 Comments. Prologue was good, first chapter equally so. I wouldn’t put it down at this point. Thanks very much for taking a read, I’m glad you liked them! Yes, I like him! Once again, Steve. All the best and good luck with CAM. Thanks very much, glad you liked the chapter. I concur. You have pacing going well early on – and that’s always important in the beginning. This story is moving right along and already developing nuances. It’s fun to slightly shake a mood mid-scene with just a little deft aside like that. It adds some more color and depth to flesh things out just a little. Thanks very much, I’m glad you enjoyed it. I like to add little things like that to a scene. Me too. It’s been a long time coming. I’m so excited for the world to meet Nate! loved the start prologue and chapter 1. also love the cover art, it is spetacular who did it for you? Thanks very much. The cover was done by a good friend of mine Eamon O’Donoghue. There’s a link to his website on my blog. He’s done a lot of great stuff.